I noticed something particularly interesting during the stock market correction last week, and I don’t think many are paying this (enough) attention. US cyclicals vs. defensives had their biggest fall in recent history, and this comes after a massive rally and has America joining the weakness seen across the rest of the world. This week’s chart came from a report where we looked at the risks and opportunities for both US and Global Cyclicals vs. Defensives. 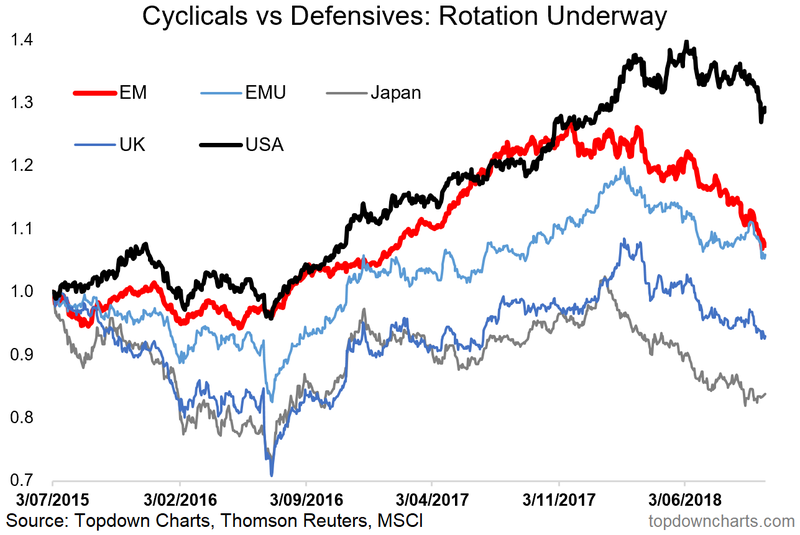 The chart shows the relative performance of cyclicals vs. defensives across the major countries/regions, and a big rotation appears to be underway. Specifically what we are looking at is the ratio of the MSCI cyclicals vs. defensives indexes. MSCI classifies cyclicals as: consumer discretionary, financials, industrials, tech, and materials; and defensives as: consumer staples, energy, healthcare, telecoms, and utilities. The standout feature in the chart is basically America beginning to “catch down” to the rollover in cyclicals vs. defensives that we’ve seen across the rest of the world. Less obvious is the fact that the US cyclicals vs. defensives line has broken down through its 200 day moving average (not shown), the relative performance line has put in a head and shoulders top pattern. The apparent rollover in cyclicals vs. defensives globally comes after a massive run-up in relative performance, and so to some extent you could call it corrective. The other thing to note is that it comes on the heels of a rollover in the global manufacturing PMI. So there is certainly some cause for concern, and this is one of the key risk areas that we are watching closely right now. As we are late in the economic cycle, it makes economic sense that this is where underlying weakness will show up first.